'Don't Be Mean' Beer: 36 N.C. Breweries Sign Up To Sell Brew Aimed At HB2 : The Two-Way North Carolina's HB2 law has sparked an ACLU lawsuit and prompted calls for boycotts. 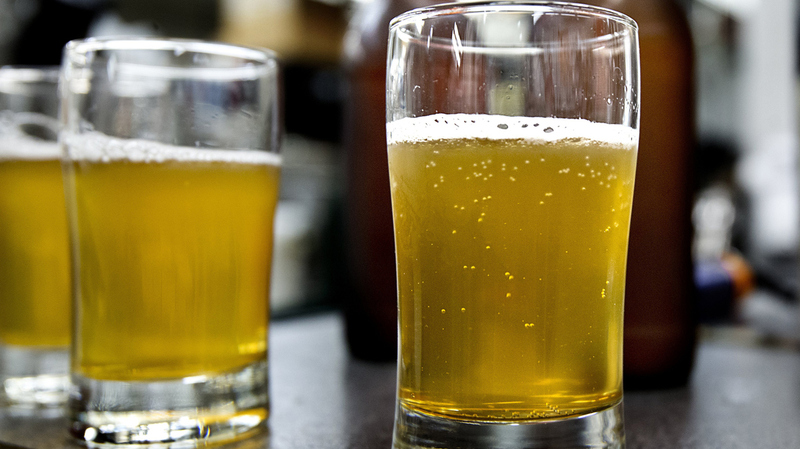 Inside the state, beer brewers say the law doesn't represent them. Brewers in North Carolina are planning to donate all of the profits from a new beer to two groups that work on behalf of the LGBT community. Three dozen breweries have signed up to sell the beer on their draft taps; cans of it will also go to people who have donated to the project's fundraising campaign, which currently stands at nearly $18,000 — far more than the original goal of $1,150. While it may seem like a symbolic gesture, the beer also signals resistance to the controversial legislation from within North Carolina's burgeoning beer industry, which last year accounted for $1.2 billion in economic impact, according to the Brewers Association. "We didn't feel like HB2 represented us as businesses or as residents of North Carolina," said Erik Lars Myers, the CEO and head brewer of Mystery Brewing Co. in Hillsborough. He's collaborating on Don't Be Mean to People with Keil Jansen, the owner and brewmaster of Ponysaurus Brewing Co. in Durham. The adoption of HB2, which keeps cities from enacting rules protecting members of the LGBT community from discrimination, has sparked an ACLU lawsuit and prompted calls for boycotts of North Carolina by entertainers as well as civic groups and businesses. Myers says their project is moving ahead despite North Carolina Gov. Pat McCrory's signing of an executive order Tuesday that the governor said "clarifies" the state legislation. Critics, including the state's attorney general, say the governor should have vetoed the law rather than signing it. "It's definitely a step in the right direction, but nothing short of repeal fixes this law," Myers says. "We still have seen no change of attitude from the people who actually put this law through." Don't Be Mean to People will be released sometime in the middle of May. As for what it'll taste like, Myers says they're going for a beer that's "bright, crisp, grainy, and fruity. And above all, delicious." The two brewers say they'll donate 100 percent of the profit from the new beer's sales to two North Carolina-based groups: EqualityNC, which opposes HB2 as part of its advocacy efforts, and QORDS, which operates summer music camps that focus on gay and transgender youth. There are currently 161 craft breweries in North Carolina, a state that in recent years has landed a string of East Coast expansion outposts from companies such as Sierra Nevada, Oskar Blues and New Belgium. Of that group, New Belgium has signed up to sell Don't Be Mean to People, according to the project's fundraiser page. "We've gathered support from dozens of our fellow brewers," says Keil Jansen, Myers' partner in the venture, "and we have the ability to make a significant social impact by working together for a greater good."